What are the Differences between Valances, Swags, and Cornices? Your bedroom windows need coverings not just for privacy, but for style, as well. One way to add some extra flair, color and texture is with a valance, swag, or cornice overlying the more utilitarian drapes or blinds. What is the difference between these window treatments, and which one will work best in your room? To help you decide, here is a list, along with some great examples. 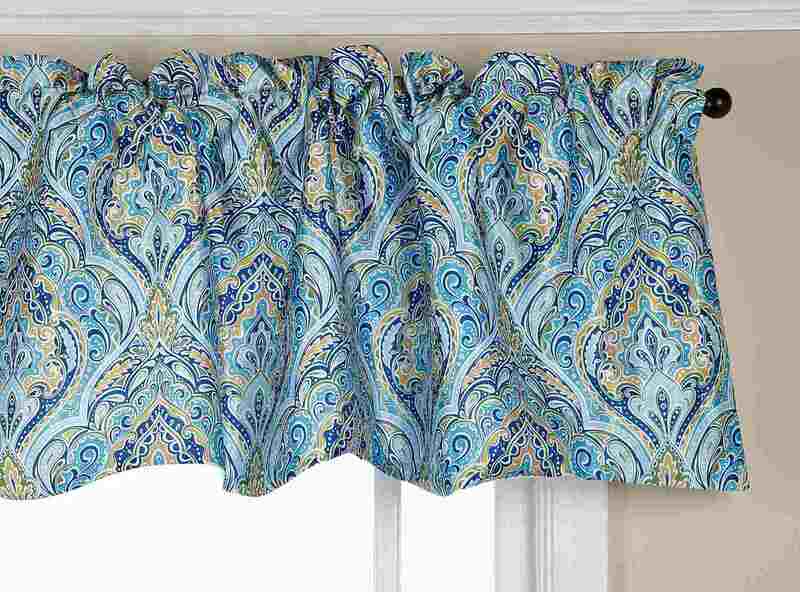 A valance is a piece of fabric that hangs across the top of a window to hide other window treatment’s hardware and add softness, color, and pattern. A simple valance is the most basic and casual treatment; it’s normally just a slip of fabric attached to the rod with clip rings or a rod pocket. Designer Tip: Simple valances can be used alone, or layered over other window treatments. The soft gathers and folds are perfect with any casual decorating style. More formal and traditional than a simple valance, a box-pleated valance hangs straight down over the window, thanks to its stitched pleats. It’s generally attached to the window with an L-shaped rod. Designer Tip: A box-pleated valance is a classic design that is perfect for traditional bedroom styles, or old-world looks like Tuscan or British Colonial. Choose a valance that matches your bedding for the most formal appearance, or go a bit more casual with a valance that contrasts in color or pattern. Swags are pieces of fabric loosely slung and draped over a decorative rod, or wound over a tieback at each corner of a window frame to add a little style and romance to your room. There are many different ways to hang swags, but one of the most common is a simple swag. In this look, the swag drapes in the middle like a valance; the ends, either cut into diagonals or simply hemmed, softly hang down on each side of the window. Designer Tip: Swags are great for a glamorous, cottage or country-style bedroom because of the sheer, romantic softness of the window treatment. A swag by itself cannot provide much privacy, so needs to be combined with other window treatments--such as curtains, blinds, shutters or shades. Swags are also a wonderful alternative to drapes for a canopy bed. Just wind the fabric over the bed’s posts, and let it drape gracefully around the corners of the canopy frame. A cornice is a box-like wooden valance typically crafted from plywood, then covered with paint, wallpaper or fabric and mounted to the wall above the window. Other cornices are carved from attractive wood and then stained to look good without the need of paint or fabric coverings. A cornice can be paired with soft window treatments--such as fabric shades, drapes, or curtains--or used alone, which provides a more formal look to a master bedroom suite. Designer Tip: Cornices work best in rooms that lack architectural interest; they can spiff up a window without trim, or give a room with no crown molding some extra appeal. Quilt, Comforter, Duvet or Bedspread: What's the Difference?